Nobody sees it coming, but when it does, divorce is hard to handle for everyone involved, including your children. If there's one thing divorced parents can agree on, it's that they need to come to an agreement that works best for their children. Below we will discuss how to make custody schedules that work best for your family, tips on how to make shared parenting work, and resources to help you make the best of it all. Joint custody, or co-parenting, is essentially shared custody, where the child custody order grants custody rights to both parents. With this type of custody order, each party is considered a custodial parent. Benefits include that each parent gets the equitable amounts of time with the child (based on the agreement), maintaining a tight bond. It also allows for a frequent visitation schedule, which is proven to be less stressful on some children. Risks include potential commute hassle. Sometimes parents don't realize that children have things they'd rather be doing than driving to and from their parents houses two or three times per week. This is especially important when the child begins participating in after-school activities and developing friendships outside of school. Another potential risk is that the child won't get the benefit of a home base, which may cause him/her to feel like a perpetual visitor in the parent's home. This is not an ideal option for parents who have trouble working together as it requires communication and collaboration to set consistent rules in both locations for the child to succeed. It should be noted, that what works for one family may not work for yours. Also, if you have multiple children of different ages, for example, what works for your 16 year-old son may not work for your 3 year-old daughter. Alternating weeks: each parent gets the child for an entire week every-other week. Alternating visit with a weekly visit: each parent gets the child every-other week, but the co-parent gets one evening visit on a weekday during their "off week." Alternating weeks with extended overnight stay: During one parent's week, the child leaves for a day or two to stay with the other parent and then returns. This is good for children who have high levels of stress when away from one parent for too long. The 2-2-3 schedule: each parent gets the child for 2 days, then one parent gets the child for three and it rotates each week. There are many variations of this schedule which adjusts the frequency or length of visitation, including: 3-3-4-4 and 2-2-5-5 rotations. The most important thing to keep in mind, is that you must be willing to work with your co-parent to make your child's life as fulfilling and easy as possible. You must be flexible, a schedule that works in the school year may not work during the summer months. - Custody Calendar: the coparently custody calendar helps parents keep track of their children's activities and their own obligations. It's every child's nightmare to be left behind due to some form of miscommunication between the two parents, make sure that it doesn't happen to yours. 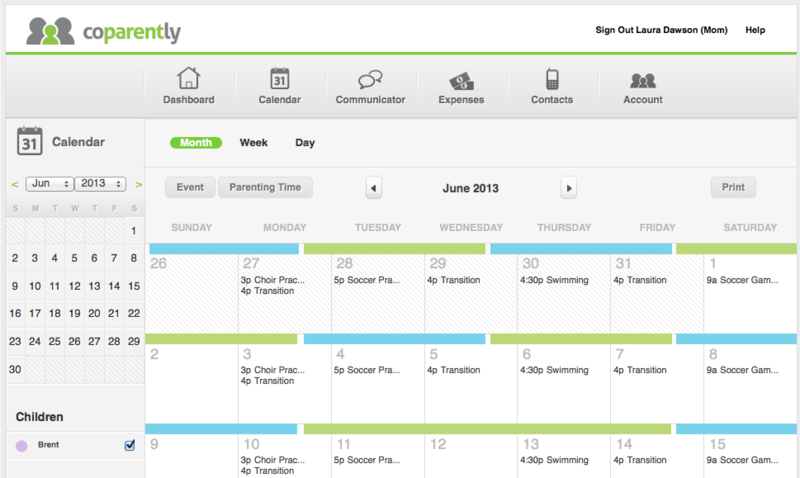 The calendar offers a color coded system with a unique acknowledge and approval option so parents can verify that they are always on the same page. - Keep your children out of the middle by maintaining professional communication with the co-parent communication tool. - Co-parent expenses: A very stressful topic regardless of divorce, money can certainly be a touchy subject among co-parents. coparently offers a tool so each parent can add expenses that they've paid or are responsible for so that there are no questions about fairness. - Co-parent Contacts: An easy-to-use online directory with all of the contact information from medical doctors to best friends. As you can see, there are several tools, schedules, and methods that work for various types of families. Your responsibility is to find the options that suit your child's needs best.